Quickly now: Rattle off several protein supplements which are grass-fed and sweetened by stevia. Five. Four. Three. Two One. Enter Jay Robb Whey Protein – one of the few (and we mean few) supplements with simple and top-notch ingredients. It has been a major player in the industry since 1988. There have been some supplement brands which fizzled out due to poor marketing and bad reputations. Jay Robb has managed to thrive all these years. 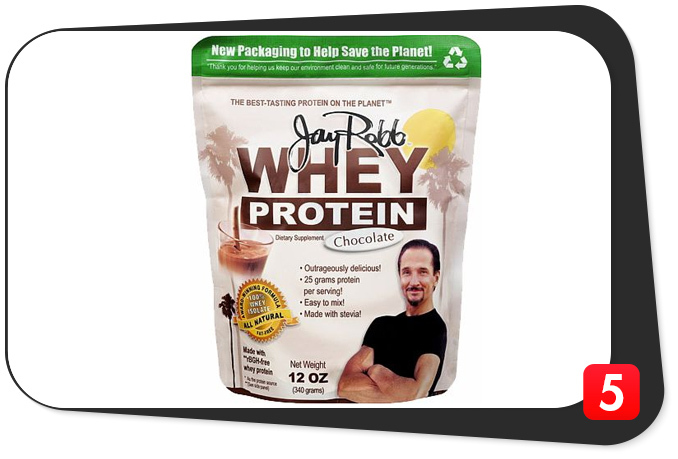 Will Jay Robb Whey Protein make you a fan for life? Let’s find out in this review. Grass-fed whey protein. Offers more health benefits than regular whey. Uses stevia as sweetener. Plant-based source which helps regulate blood sugar levels. Comes in six awesome flavors. Namely Chocolate, Pina Colada, Strawberry, Tropical Dreamsicle, Unflavored, and Vanilla. Directions For Whey Protein: Take one or more scoops daily to supplement the diet with additional protein. Mixes great in a blender with water, milk or your favorite beverage. He admitted he had no idea his shake would be sold in more than 10,000 stores across the country several years later. Jay Robb “uses the highest grade of whey protein possible when creating the best-tasting whey protein powder,” per its official website. The company’s cross-flow microfiltering process yields a high amount of protein in its WPI content. Each serving of Jay Robb Whey Protein has 25 grams of protein. Most protein supplements in the industry are within the 25- to 26-gram range. This product is right at the industry average. Meet Jay Robb: The man behind this timeless protein supplement. Jay Robb Whey Protein also uses whey protein isolate exclusively. While some bigger-name products such as Optimum Nutrition Gold Standard 100% Whey combine whey protein isolate and whey protein concentrate, Jay Robb kept it simple. Between WPI and WPC, the former is the purer form of whey with a 90 percent composition. Thus, WPI has a lower carb and fat content. It is the better option for people who are lactose intolerant. The most impressive feature of Jay Robb Whey Protein is its source: grass-fed cows. How many protein supplement manufacturers can say this? The company’s official website says it uses “farm-raised, pasture-grazed, grass-fed cows not treated with the synthetic bovine growth hormone rBGH.” With that, we can all breathe a sigh of relief. Grass-fed whey protein helps increase strength. It also helps decrease the likelihood of toxins, inflammation, and the dreaded E.coli bacteria. Far too many protein supplements include fillers and proprietary blends which deceive the consumer. A clean and simple product like Jay Robb Whey Protein should have its place in your supplement stack. Total fat, 0 g: Jay Robb Whey Protein is one of the few in the market with zero grams of fats per serving. Our impression is the company’s micro-filtration process is top-notch since there are no fats whatsoever. Cholesterol, 0 mg: Just like fats, cholesterol isn’t the enemy. You need the good type for optimum cardiovascular health. Nonetheless, Jay Robb Whey Protein’s zero grams of cholesterol is something to marvel at. Sodium, 150 mg: A good number of protein supplements have sodium content within this range. However, others such as MyProtein Impact Whey Protein limits theirs to fewer than 35 mg. This one may be a tad bit high for some who have cardiovascular issues. Talk to your doctor first. Potassium, 390 mg: While the right amount of potassium can help regulate blood pressure, too much of it may be detrimental for individuals who have cardiovascular concerns. This bears repeating: Ask your physician for advice before purchasing. 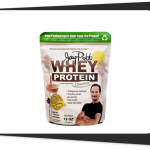 Total carbohydrate, 1 g: Jay Robb Whey Protein is a good low-carb option. We like the fact it is sweetened with stevia, a plant-based ingredient which helps maintain good blood sugar and blood pressure levels. Calcium, 30 mg: Jay Robb Whey Protein doesn’t offer much calcium content (three percent of the required daily value). For this, drink your milk and eat your cheese, folks. Jay Robb Whey Protein features 25 grams of high-quality, grass-fed whey protein isolates (WPI) per serving. Plus, most of the flavors taste great. In terms of protein quality, this product is far and away one of the best in the industry. The carb, fat, and cholesterol content are low. Like we already pointed out, this is a reflection of Jay Robb’s excellent micro-filtration process. 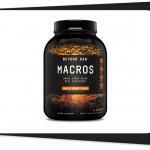 This supplement is best geared toward individuals who want to build lean muscle (emphasis on the word “lean”). Hey, is this lean enough? The two things that caught our eye were the sodium and potassium content, which are a bit higher than normal (although not extreme). Take the necessary precaution and talk things over with your doctor if you have any health concern. We also like the fact the manufacturer uses stevia as a sweetener. It’s hard to come across a trusted brand which uses a plant-based ingredient which can help regulate blood pressure and blood sugar levels. There are just too many supplements out there which use acesulfame potassium and sucralose (although the FDA deemed both to be safe for consumption). This one isn’t of them. Just by looking at the ingredients list, you can tell they are simple yet top-notch – no proprietary blends and no fillers. Never hesitate to purchase a protein supplement as good as this one (for a comprehensive guide on how to purchase supplements, check this out). Alpha-lactabumin is the primary protein in human milk. It has high levels of cysteine, which helps increase glutathione levels in the body. Glutathione is an antioxidant which helps ward off cancer cells. Score another point for Jay Robb and Co. Taking all of these into consideration, Jay Robb Whey Protein has one of the highest-quality protein content around. Not only does it have 25 grams per serving to help feed your muscles, it also has protein content with excellent and proven health benefits. Jay Robb Whey Protein is ideal for athletes and active individuals who want to build lean muscle, boost recovery, and meet their daily protein requirements. It is also suited for people who want to include quality protein in their snacks for better overall health. Too much of anything can be detrimental. The same goes for any high-quality protein supplement. In the case of Jay Robb Whey Protein, the sodium and potassium content may be something to look out for if you have any cardiovascular issues. It bears repeating: Talk to your doctor first if you spot an ingredient which you’re iffy about. Twenty-five grams of protein per serving. Pretty good amount. Low-fat and l0w-cholesterol. Good stuff. Sweetened with stevia. Plant-based natural sweetener with proven health benefits. Good taste. Customer reviews are generally positive on the flavor and texture here. Relatively high sodium and potassium content. Talk to your doctor first if these concern you. It’s no wonder Jay Robb Whey Protein has been one of the most trusted brands in the bodybuilding supplement industry for almost 30 years. 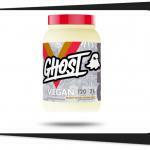 The company produces simple yet top-notch ingredients which leave the consumer wanting more. 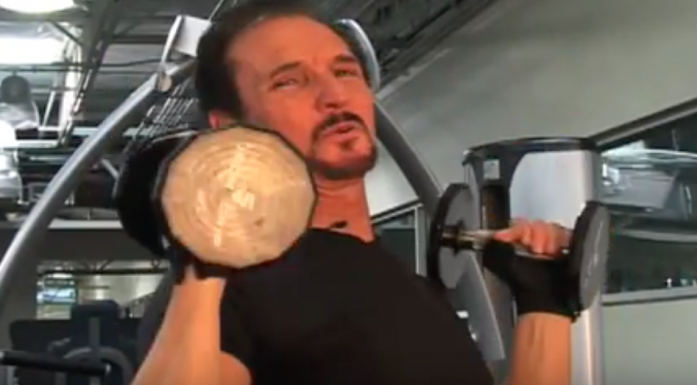 We’re not surprised one bit why many big-name fitness websites consider it as one of the best. You can’t possibly pass up on high-quality, grass fed whey sweetened with stevia which builds muscle, boosts the immune system, and helps prevent cancer, among other things. There’s just too much good stuff going on – so much they help offset the negative.